Arthur Pewty's maggot sandwich: The Bird and Barrel opens. The Bird and Barrel opens. 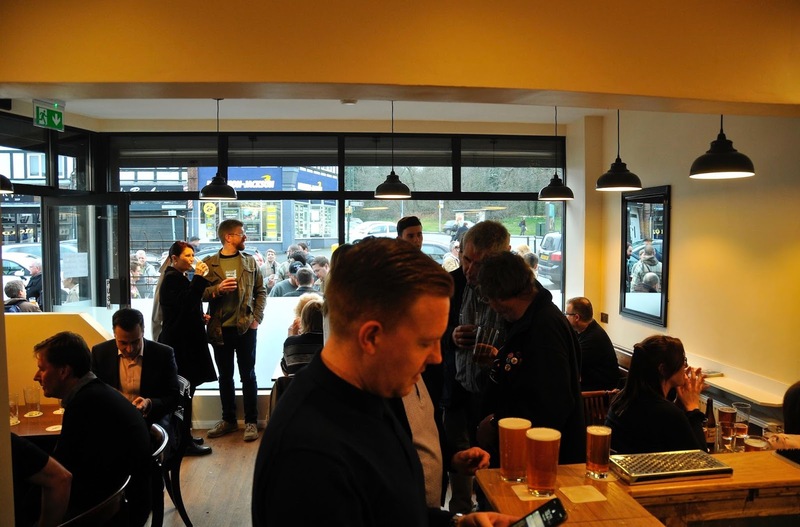 The much anticipated launch of The Bird and Barrel micro pub happened on Friday evening. The new micro pub is the first licenced premises owned by The Bexley Brewery. It is located in the parade of shops in Barnehurst Road, Barnehurst, close to the 229 and 99 bus routes, and about two minutes walk from Barnehurst railway station. The Bird and Barrel occupies the former shop unit previously used by Aquacadabra - the tropical fish specialist shop, which closed some years ago. Work has been under way for some time to convert the former shop into a pub, and I understand further work is going to take place. An invitation only "soft launch" took place on Thursday night, which I attended, along with around twenty other guests, and a great time was had by all. I don't think anyone was expecting the number of people who turned up on the Friday - as you can see from the top photograph, dozens of guests spilled outside, as things got quite cramped in the main bar area. It was interesting to see the number of commuters passing on their way home from the station - many peered through the glass windows, wondering what was going on, and I spoke to one who came in to ask, and ended up buying a drink and staying for a chat; I suspect this will be a common occurrence over the next few weeks as locals realise that a friendly micro pub has opened close to their homes. The Bird and Barrel is the brewery tap for The Bexley Brewery, but it does not just serve Bexley beers - there are a wide selection of guest ales available, as well as cider, numerous wines, single malt scotch and boutique gins, as well as some posh soft drinks. The place is ideally situated, not just for public transport, but also for a number of nearby restaurants and takeaways. 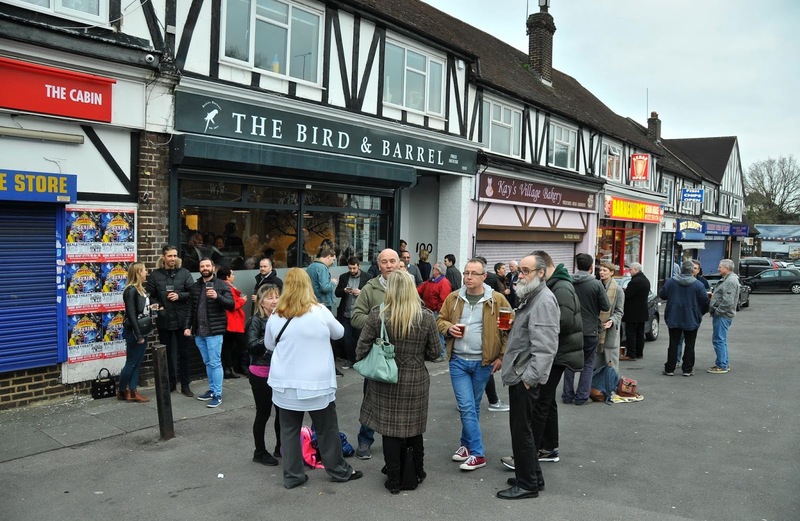 Like other micro pubs, The Bird and Barrel serves snacks such as crisps and other nibbles, but does not serve meals, but hungry drinkers have a number of choices with nearby restaurants, so this is not really an issue. As one would expect, the real ales served in The Bird and Barrel are extremely well kept and perfectly served. 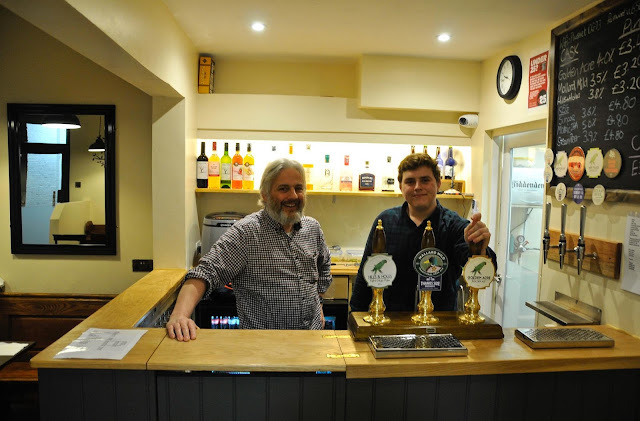 Cliff and Jane Murphy, along with their son Cameron (Cliff and Cameron are shown behind the bar in the middle photograph above - click on any photo for a larger version) have put in a huge amount of work to get their micro pub up and running, alongside keeping the successful brewery business operating, and supplying their many resellers around the region. Click here to see a map of all the places that sell Bexley Brewery beer. I have in the past heard some concerns that the close proximity of the large Red Barn pub might cause competition issues for The Bird and Barrel - from experience, I think if anything it will be the other way around. To be honest the two places cater for vary different sectors of the market. The Red Barn is basically a sports pub selling large quantities of chilled, gassy and flavourless lager to people who just want to shout at a TV screen when the football is on. In contrast The Bird and Barrel serves locally hand crafted real ales to a discerning clientele who prefer conversation to other distractions. I can see a few curious Red Barn regulars coming for a pint at The Bird and Barrel, liking what they find and defecting, but I really do not see any customers from The Bird and Barrel ending up in The Red Barn. Have you visited The Bird and Barrel yet, if so, what did you think? Please feel free to leave a comment below, or alternatively Email me at hugh.neal@gmail.com. I took the photo above last Sunday afternoon, not long after I published the last Maggot Sandwich update. It shows the recycling centre behind Morrison's supermarket in Erith, and a huge pile of recently fly - tipped material, which appeared to be a mixture of domestic and building waste that had been illegally tipped there some time on Sunday morning. I sent the photo, along with a second, taken from a different angle, to the head of Bexley Council anti fly - tipping team, and the waste was duly removed for proper disposal on Monday. I then went back round to the recycling site on Monday afternoon, only to find a fresh new pile of illegally tipped waste in exactly the same position! I understand from a document sent to my by one of my most reliable sources, that Bexley Council have finally debated the purchase of some CCTV cameras specifically designed to be used to combat the criminals who fly tip in the borough. The proposal for the purchase of the security surveillance cameras was accepted, amongst a number of other proposals designed to improve how waste and recycling was undertaken in the borough. The proposals can be broken down as follows:- "RECOMMENDATION 1a – The Council should improve its marketing and promotion of the bulky waste collection service and reuse and recycling centres. Agree with recommendation. Timescale 6 months. RECOMMENDATION 1b - Enhance marketing around the location of reuse and recycling centres in areas of the borough where there are high fly-tipping incidences e.g. Thamesmead. Agree with recommendation. Timescale 6 months. RECOMMENDATION 1c - JC Decaux boards should be used advertising reuse and recycling centres and opening times.Agree with recommendation but slots for access to these advertising panels is limited and would need to be prioritised with other services. Agree with recommendation but slots for access to these advertising panels is limited and would need to be prioritised with other services. Timescale 12 months. RECOMMENDATION 2 – Easier and more prominent web link for accessing ‘Report fly tipping’ on the London Borough of Bexley website. Agree with recommendation however liaison with the Web Team would be required to agree any timescale. Timescale provisionally 12 months. RECOMMENDATION 3 – Increase communications on fly tipping penalties and residents’ responsibilities. Agree with recommendation. Timescale 12 months. 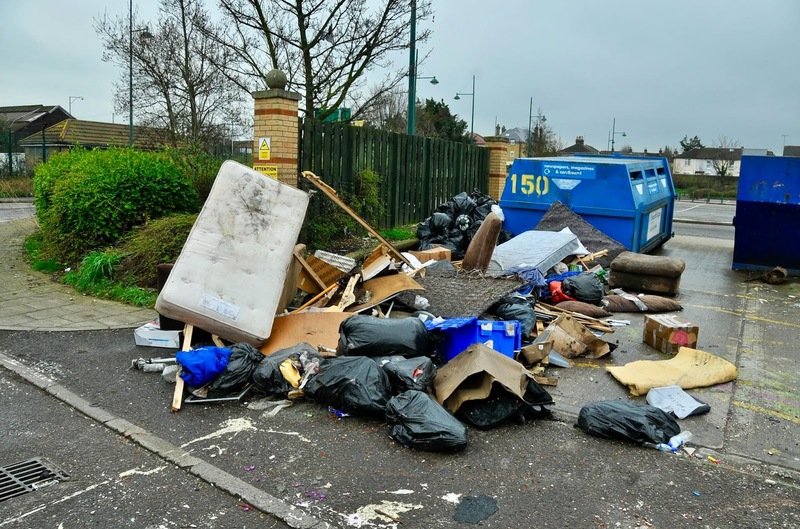 RECOMMENDATION 4- The Council should consider additional fly tipping prevention measures at fly-tipping hotspots, in particular Ray Lamb Way which is the worst fly tipped area in the borough; for example, use of Automated Number Plate Recognition (ANPR) cameras. Agree with recommendation subject to available funding and compliance with traffic regulations. Timescale 12 months. RECOMMENDATION 5 – Greater liaison with partner agencies especially the Environment Agency. Agree with recommendation. Timescale 6 months and ongoing. RECOMMENDATION 6- Planning informatives should be appended to all applications granted to remind residents to check for contractor’s ‘Waste Carrier licence’. Agree with recommendation subject to consultation with Development Control. Timescale 6 months". Whilst I wholeheartedly agree with the proposals outlined above, I feel that they have missed an even greater opportunity to reduce the level of criminal fly tipping in the borough. According to Government statistics, local authorities reported 852,000 cases of fly-tipping last year, and almost 98 per cent of fly-tipping prosecutions resulted in a conviction. From my own experiences investigating fly – tipping, the proponents are well aware of what they are doing is illegal – but they just don't care, as they think the chances of them being caught are minimal at best. It is a cynical and exploitative attitude from criminals who should (and indeed sometimes do) get jailed for their activities. On Thursday morning I had a conversation with a very pleasant and friendly chap who was clearing fly - tipped waste from the Morrison's recycling site. His experience was that he felt that around thirty percent of the material left at the various recycling centres around the borough was due to the hoppers not being emptied nearly often enough - he used the example of the cardboard and paper hoppers in Morrison's car park, which were rammed full to the brim for over a week without being emptied. Law abiding people bring their waste to be recycled, only to find the recycling hoppers full. The people are hardly likely to want to take their waste back home with them. This got me thinking – Why do certain individuals fly tip in the first place? I think that there are several factors involved. Firstly I think there is a degree of ignorance – some of the fly tippers do not have English as a first language, and may assume that since there are recycling bins and hoppers, such as those found in Erith Morrison's car park, that anything can be deposited there. Of course this precludes those who tip anywhere at any time – there can be no excuse for that. Other tippers may be lazy and not bothered to go to the official council tip in Thames Road, Crayford. I think the biggest reason is down to cost. Commercial operators (basically any person not in a private car) get charged heavily for legal tipping. A single Transit – type van full of waste can be charged over £120 for a single tipping visit. I have spoken to the Council about this. I understand that when illegally tipped waste is cleared up, it is done by a council subcontractor, who charges the council over £300 for the work. Basic arithmetic would dictate that it would be cheaper for the council to allow waste dumping to be carried out by traders for free, rather than to have to clear up the illegally tipped waste at a later stage. I would propose a six month trial period where commercial waste tippers were not charged for using the Crayford dump; in all other ways they would still have to comply with the existing waste disposal rules, and the content of their loads, the company name and vehicle registration number would still be recorded, but no money would change hands. If at the end of the trial, the amount of fly tipped waste had substantially reduced around the borough, then the scheme would be judged a success. I think a pragmatic approach may be worth trialling, as the current system does seem to be failing, and the amount of council tax payers money spent on clearing up after the illegal tippers could be far better spent elsewhere. Don’t think I am opting for a soft approach to criminal activity – I am still strongly of the opinion that catching and prosecuting fly tippers should be a high priority, but a mixture of both carrot and stick, rather than stick alone may deliver better results for both the environment and the council taxpayer. What do you think? Leave a comment below, or alternatively Email me at hugh.neal@gmail.com. 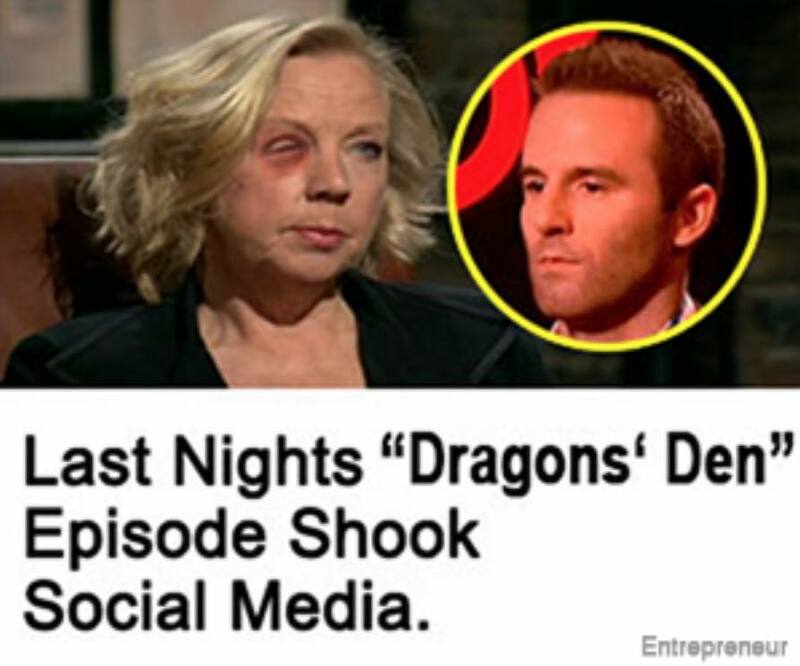 You may have seen the adverts above on the News Shopper website recently; the upper picture, which shows a very badly Photoshopped image of Dragon's Den investor Deborah Meaden apparently with a bruised eye. This was the "click bait" used to encourage web surfers on the News Shopper website to click on the link; when they did so they ended up on a website depicted in the lower of the two images above. It purports to be a Bitcoin trading system which states:- "Appearing on BBC Two's hit show, Dragons' Den, two best friends from university pitched their idea for an automated bitcoin trading platform, called Bitcoin Code. The idea was simple: allow the average person the opportunity to cash in on the bitcoin boom. Even if they have absolutely no investing or technology experience. You simply follow the Auto Suggestions in the system and place your trades. A user would simply make an initial deposit into the platform, usually of £250 or more. The user should open a position on Bitcoin and let the trend do the work for him. The entrepreneurs intend to make money from their platform by charging a small commission on only the profits a user generates. They asked the Dragons for £200,000 for 25% of the company, valuing the company at £800,000. To demonstrate the power of their company's platform the entrepreneurs had Deborah Meaden deposit £250 live on the show. "I've heard about Bitcoin and the massive amount of money you can make from it, but I've never bought any. I no idea where to start. This was really easy, I can just use my credit card to deposit money and it buys them for me." Deborah said. After her initial deposit of £250 was made using Bitcoin Code, account management helped her opened up a position on Bitcoin so she could buy low and sell high. All the Dragons were immediately impressed by how easy it was to make money. The platform handles all the trading work automatically and because the price of Bitcoin is quite volatile, there are numerous opportunities to profit. "Bitcoin is so hot right now and if even somebody like Deborah, no offence Deborah, can make money from it, I'm all in. I need to have a piece of this. I'm going to make a huge offer, £2 million for 25% of the company." Peter Jones said. 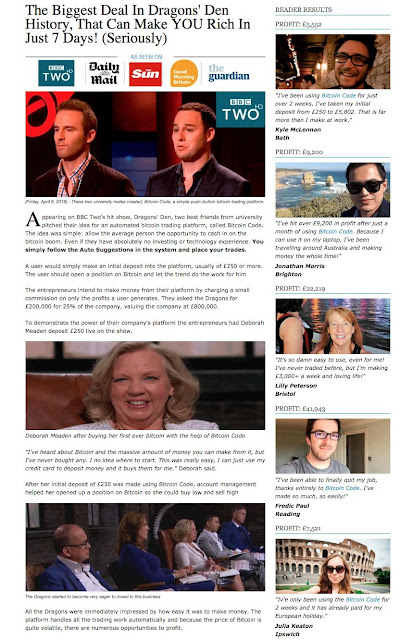 Before the entrepreneurs even had a chance to respond to Jones's offer, Deborah Meaden interrupted and said with a smile on her face: "I've gone up to £398.42 after just 8 minutes". Needless to say the TV show has never featured The Bitcoin Code, and none of the investors have ever had any involvement with the alleged trading system, which is of course actually a criminal scam. Adverts for The Bitcoin Code have appeared briefly on a number of major websites, including the Guardian and The Daily Mail, but have mostly been taken down after it became clear that they were fraudulent. I have done some fairly in depth investigation into the con, and it would appear that the confidence tricksters behind it have targetted their attentions at vulnerable people in various countries - there is an Irish themed version of the Dragon's Den story, as well as an Australian one, each featuring the stars of the popular TV franchise for that particular market. In fact, one of the Irish Dragon's Den investors has launched a campaign to try and stop the criminals from using his image in their fraudulent adverts. In an interview with the Irish Mirror, businessman Gavin Duffy said:- "It’s very convincing. When I read it I laughed because I know it’s not true. You can laugh about it but imagine if you were in the UK reading this. It reads well and it sounds legit, that the investment happened and this thing is doing very well. What’s very concerning is when you try to get it taken down or point out to news organisations that on their news pages they have an ad about a Bitcoin scam, you would have thought they would react, take it more seriously and do something about it. But that doesn’t seem to be the case at all. It’s down off the BBC site now but maybe it was only booked for a day - it’s on the Guardian’s site today and maybe another one tomorrow. Maybe that’s how the people behind this scam are organising it?". A word of caution, this financial scam has nothing to do with any form of cryptocurrency, least of all Bitcoin. This is a vile plot which is was contrived by unethical online promoters with the sole intent of defrauding and stealing money from unsuspecting opportunity-seekers. These rip off artists are particularly successful because they are exploiting the recent surge of Bitcoin popularity, and in this context employing a kind of piggyback strategy designed to get you to drop your guard and buy into this Bitcoin cryptocurrency scam. You have been warned. Now for this weeks local safety and security updates, courtesy of Bexley Borough Neighbourhood Watch Association. Firstly Barnehurst ward:- "Another very good week crime wise across the ward this week with only one crime of note to report which is sadly another burglary. The offence occurred on Friday 6th April between 6.20pm and 10.20pm where suspect(s) have gained entry to a semi-detached property in Woodside Road by smashing a glass panel in the rear kitchen door. Property taken included jewellery, cameras and a number of sunglasses. Regarding reports of mopeds riding in an anti-social manner in and around the area of Hall Place and Marden Crescent. We have identified one of the riders involved and he will be receiving a home visit this week. We use several tactics in an attempt to combat anti-social behaviour which in this case have included plain clothes patrols and the deployment of our off road motor cycles, However our biggest asset is you. You can make a difference in your area by letting us know who is causing issues in your street. If you have any information please contact your local policing team or alternatively call crime stoppers on 0800 555 111. Please join us on Wednesday 18th April at 1pm, Barnehurst Golf Course for an informal chat with a member of the Barnehurst team about any local issues and crime prevention advice. Please also give us a follow on twitter @MPSBarnehurst and Facebook Barnehurst police". Belvedere ward:- "There have been reports of potential drug dealing around the Upper Abbey Road area, in the small car park with the path that leads up to the play area. Apparently a silver car with black males have bene parking in the car park and dealing. We have no set days or times for this so if anyone does notice any suspicious activity then please let us know. We have also been made aware of anti-social behaviour and drug usage next to the football area on Monarch Road. By all accounts a group of about five teenagers are gathering near to the entrance to the football area and causing a nuisance by being loud and abusive. They are also reportedly smoking cannabis. Again if anyone has any information about this group (names etc) or can give us further information on when they gather, please get in contact - see details above. Or you can contact Neighbourhood Watch [by replying to this email] or call Crimestoppers on 0800 555 111". Brampton ward:- "Another great week for Brampton with only 3 crimes reported in the last 5 days, and no burglaries. There was a shoplifting from Sainsbury’s Brampton Road. A road rage incident occurred on the 5th April on Bristow Road which resulted in a GBH but involved no Brampton residents. On the 9th April there was a theft of motor vehicle where a van was taken off a drive in Brampton Road, however the van had been left unlocked and running while the owner (a window cleaner was working) Brampton continues to be one of the safest wards on the Borough. Remember all ward boundaries change on May 3rd". Christ Church ward:- "We have had one report of a residential burglary, this was on the 06/04/2018 at Glengall Road Bexleyheath. Entry was gained via the front of the property and personal items taken. There has been one report of theft of motor vehicle on the ward which took place on the 10/04/2018 at ASDA carpark. Number plates were been taken off the vehicle. On the 03/04/2018 – There was a report of theft of mobile phone on a bus along the Broadway Bexleyheath. Victim had either been pick pocketed or the phone was dropped and then stolen. On the 09/04/2018 – Money was taken from victim that was put on a table outside a coffee shop whilst sitting outside and victim not looking. The team did hold a traffic operation recently on the ward, this was mainly to target burglary offenders travelling on the ward. As a result of this two vehicles had been seized. The team are also conducting high visibility patrols in our burglary hotspot areas, which is mainly the streets between Townley Road & Upton Road. Car parks are also incorporated for issues with anti-social behaviour. If you do speak to anyone who lives on the ward who does not have NHW set up on their street, please put them through to us if they are interested in maybe joining [or reply to this email quoting 'Christchurch SNT Team']. If you would like to contact us, please feel free to make contact via email, twitter or over the phone - details above. For crime prevention advice, please look at the Met Police website which does have information that you may find useful". Colyers ward:- "Having had no reported motor vehicle crimes for three weeks in a row this past week has seen two vehicles stolen in Northumberland Way. A motorbike was stolen from a driveway overnight Thursday 5th - Friday 6th April despite being undrivable and waiting to go to the skip. The other was a stolen overnight Sunday 8th into Monday 9th April, taken without the keys but no further information available at this time. An elderly resident in Fairford Avenue has been scammed out of cash by people pretending to be from a bank investigating their employees even handing over their cards and pin numbers. Please do not allow yourself to become a victim. A bank will never call you up and ask your personal details or to withdraw cash to be picked up by a courier for whatever reason. Unfortunately there was an attempted burglary in Frinsted Road the evening of Wednesday 4th April. The house was locked and secure residents returned home to find their rear patio door damaged and slightly ajar. Nothing was taken and it is believed that the intruders were disturbed by the next door neighbour's dogs. An old air rifle has been seized from an address in our ASB hotspot Hampton House and the team assisted Northend DWO's with a drugs warrant in Canterbury House where drugs were seized and a fine issued". Crayford ward:- "Front and rear number plates were stolen from a vehicle parked in Medway Road between 18.30 on 3rd April and 07.15 on 4th April. On 10th April between 01.00 and 01.37 suspects tried to steal a Land Rover and two other vehicles in Ridge Way. They were disturbed and made off toward Ridge Avenue and getting in to a vehicle and driving away, no description of this vehicle unfortunately. In the early hours of 7th April a 21 year old male had his Android phone and bag stolen whilst in an alleyway near Thames Road, he did not report being injured. Between 20.00 on the 6th April and 18.15 a resident in Crayford Way reported that someone had tried to prise a door off their Honda Civic whilst parked on the drive way. There have been shoplifting offences reported by Currys on 6th April, Smyths Toys on 7th April and Hobbycraft on the 9th April. Between 19.00 on 6th April and 12.00 on 7th April a vehicle was broken in to whilst parked outside a property near 222 Iron Mill Lane, items were strewn around the vehicle and a pair of spectacles were stolen. On 10th April at 11.49 CCTV shows that used lorry/large vehicle batteries were stolen from outside a business on the Acorn Industrial Estate, a white Ford Van was used for this and it was reported that the vehicle has been seen on the estate previously committing a similar crime. It has been a busy week for our team. Last Friday our team made a routine vehicle stop. It then became apparent that the vehicle had no insurance, no MOT, a bald tyre and that the driver was using a provisional licence. The driver was processed and the vehicle was seized. Initially, as the vehicle was stopped, this driver was going to be advised about their speed as this is a ward priority in the Iron Mill Lane area. On Monday 9th April Crayford officers executed a warrant leading to the arrest of a male in connection with knife point robberies. On Thursday 5th April a vehicle was observed driving without due care and attention, weaving in and out of vehicles at high speed in Thames Road. This was captured on our body worn camera, other factors prevented us giving chase but later our checks showed this vehicle also had no MOT. The driver’s prize was a process ticket at his front door (3 points and a fine) as well as a section 59 notice. Several youths with vehicles have been causing anti-social behaviour near Crayford railway station and we have been speaking to local residents to gather information to assist in identifying these youths. Our partners at London Borough of Bexley have agreed to allow a camera to help us further with identification and dealing with this anti-social behaviour, local residents will be advised when this is placed. Meanwhile, there have been foot patrols as well as mobile patrols in the local area. We have received some reports of anti-social behaviour and possible drug dealing near Green Walk and Hill Rise, if you have seen any of this behaviour we would be happy to speak to you in total confidence, please call us on 0208 721 2584 or email Crayford.SNT@met.police.uk or alternatively via www.met.police.uk or by contacting Crimestoppers on 0800 555 111 for which your call would remain anonymous'. Erith ward:- "We have actively been patrolling the full ward of Erith. Conducted a weapons sweep in the areas of West Street and Compton Place 11 youths where stopped and all there details were taken as they were causing ASB in Parkspring court. PCs Gill and Tom carried out arrest enquires across Erith this week PCSO Adam had a meeting with Mandy from Sherwood House regarding upcoming events, working with residents in residential housing about staying safe, PCSOs Adam and Mark ( from North end ward ) are hoping to visit all the schemes in the north of Bexley over the coming months to chat to all residents. Dates for you diaries - 25/04/18, 7pm Erith pier road police offices – Erith Ward Panel meeting. We hit 1000 followers on twitter thanks top the efforts of PS Young feel free to follow us for the latest policing news in Erith twitter @MPSErith" Lesnes Abbey ward:- "Burglaries - Burglary occurred in New Road between the hours of 5:00pm on Tuesday 03/04/18 and 1:00 pm on Friday 06/04/18.the garage was broken into a pedal cycle and motor cycle taken .The motor cycle was later found and the owner made aware. On Tuesday 10/04/18 at 10:41 am a burglary occurred in King Harolds Way. The front wooden door was forced open and an untidy search occurred. Local residents made police aware. The home owners were out of the property ta the time. Motor Vehicle Crimes - Overnight from Tuesday 03/04/18 to Wednesday 04/04/18 a vehicle locked and secure parked in Lensbury Way damaged. Other News - After the local council elections on 3rd May, The ward boundaries will then be split up, Lesnes Abbey will go and you will be with different wards. Once these have been decided we will let you know. Date for your diary. Have a say On Thursday 19/04/18 between the hours 2:00 pm and 3:00 pm at the Lesnes Lodge". North End ward:- "There was a burglary overnight Saturday/Sunday in The Nursery. Entry was made through the back door and an expensive Brompton fold up bike was stolen. Nothing else was taken so it may be that this was deliberately targeted for the bike only. There was also a burglary during a five day period at the start of April in an empty property at the far end of Frobisher Road. The boiler was taken leading to water damage within the property. The flat is owned by L and Q housing and they have secured the door. Over recent weeks there has been several attempted break ins in the tower blocks in Boundary Street. They are being targeted as the blocks are gradually being emptied of all residents before redevelopment at the location next year. At our upcoming Ward Panel meeting next week (April 18th) we will be suggesting the area as a ward promise so we can assist Orbit in stopping any criminal damage before the blocks are pulled down. An update on the panel meeting will be sent in the next week or two. 3 males were stopped and searched at the back of Canterbury House on Tuesday afternoon, resulting in a cannabis seizure and warning given. A drugs warrant was executed this morning (Wednesday) in Canterbury House. A quantity of drugs were seized and the suspect was issued with a fine". Northumberland Heath ward:- "Good news this week. We have identified three youths from images sent to police. As a result of this, they all received a visit from us. Two youths identified riding the motorcycles in the Northumberland Heath Recreation Ground were issued with a Section 59 warning notice. One not seen riding a bike was given words of advice. We also issued a Section 59 warning to a motorist driving erratically. We are delighted that there have been no burglaries or motor vehicle crime reported to us over the last week. The team are conducting weapon sweeps in out crime hotspot areas following the recent tragic knife incidents across the capital. Our message to the public to help us to tackle this issue is to report anything they see or hear that could help us take more weapons off the street". Thamesmead East ward:- "Pleased to report that no burglaries have been reported so far this month. During the early hours of Saturday 7th April, a vehicle was damaged in Middle Way, by someone slashing the tyres. Please make sure you lock your vehicle doors at all times, (even for a short amount of time) as a mobile phone was taken from a car that was parked in Chadwick Way. While out on routine patrol, PC Pruden came across a vehicle with a punctured tyre that was parked up in New Road. Checks revealed that the vehicle had been stolen from an address in Sidcup, March 2018. PC Nana assisted Bexley Council regarding securing a property that had a squatter living at an address in Pointers Close. As part of a drive to curb violent crimes among young people, PC Nana has been visiting and engaging with young people that she has identified to be at risk of getting involve in violent or drug related crimes. Working in Partnership with the Peabody youth engagement team, two males have currently been referred to their apprenticeship / employment programmes". The end video this week shows something that many local people may not be aware of. The British Gypsum Technical Training Academy is located in Church Manor Way, Erith. It teaches dry lining and plastering skills to members of the construction industry. It is the longest serving training facility in the UK, delivering Thistle plasters and drywall systems training since it opened in 1966. Watch the short video below, and leave a comment should you so wish.